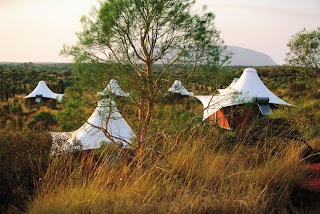 Traveller: Travel News and Stories: Romance in Australia's Red Centre! Treat your Valentine to something extraordinary next month with a private dinner for two on a sand dune, watching the sun setting over Uluru and Kata Tjuta. It's hard to beat the romance of dining in the middle of Australia's vast and spiritual landscape of Uluru-Kata Tjuta National Park, just you, your partner and the views. Enjoy the finest Australian wines and champagnes, and delicious Australian delicacies, all hand-prepared by newly-appointed Chef de Cuisine, Jane Meban. Private dining at Longitude 131° provides the ultimate fine dining experience, under a canopy of glittering stars, surrounded by the solitude of the Red Centre Australian desert. Rivalling some of the best hotels in the world, Voyages Longitude 131° is the most spectacular campsite in Australia, featuring 15 white elevated "tents" dotted amongst the vast Australian desert landscape. Treat yourselves to a truly once-in-a-lifetime experience at Longitude 131° for Valentine's Day.